Before handing over command on Thursday, the outgoing Commander of Combined Task Force 151 (CTF 151) thanked the staff and sailors of Combined Maritime Forces (CMF) for their contribution to anti-piracy efforts in the Gulf. Commodore Muhammad Hisham, Pakistan Navy, praised the efforts of the men and women under his command before handing over the reins of CMF’s anti-piracy operations to the Republic of Singapore Navy’s Rear Admiral Giam Hock Koon. However, he also reiterated that there is still a lot of work to do in the ongoing fight against piracy. Speaking of his three-month time in command of CTF 151, Cdre Hisham said: “No Commander can successfully accomplish his mission without having professionally competent and ready forces at his disposal. “In this regard, I was lucky to have under my tactical control fully committed and dedicated units like USS Farragut, HMS Northumberland, HMA Ships Anzac and Toowoomba, ROK Ships Kang Gam Chang and Munmu the Great, and PNS Alamgir. 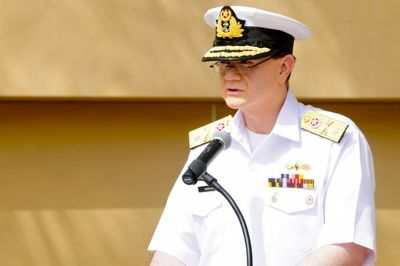 Commodore Hisham also took time to praise the shore-based staff at CMF HQ, adding: “I extend also special thanks to CCMF, Vice Admiral John Miller, USN DCCMF Commodore Simon Ancona RN for providing me with support in the form of vital information as well as provision of ships and maritime patrol and reconnaissance aircraft. “I would also like to thank Commodore McHardie RAN Combined Task Force 150 for assisting me with assets whenever needed.